I use these seeds in my bread baking, and so I found this very interesting. Caraway is a popular Middle Eastern herb. Its seeds are used as an anise-scented spice in cooking. You might find this under the name of Persian Cumin. The leaves, roots and seeds are used. The plant is a biennial with divided fern like leaves and a parsley-dill fragrance. It has a spindle shaped taproot which can be cooked as a root vegetable, like carrot. The flowering stem bears tiny white flowers touched with pink that are followed by crescent shaped ridged ‘seeds’. These are known as ajmud and is a popular Indian spice. The plant requires a well drained fertile soil and a warm sunny position. Sow caraway seed directly into the soil in either spring or autumn. Regularly weed and water the crop, as the seed is slow to germinate. Water in the morning and not from above. Gather leaves at any time. Lift the roots after harvesting the seeds. Cut flowering stems when the seeds begin to darken and ripen. In order to dry, hang the stems upside down in small bunches. Shake the bunches before storing. The seeds often contain insects so freeze before storing to kill the eggs. 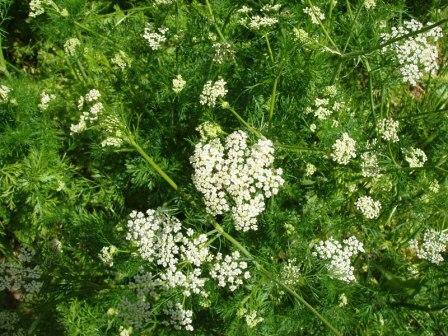 Caraway seeds are used to flavour rye bread, sausages, cabbage dishes, cheeses, soups, pork dishes, goulash, harissa and cooked apples. Schnapps contains caraway seeds, as well as ‘sugar plums’ which are sugar coated caraway seeds. Use the feathery leaves in salads and soups. I adore caraway, but have great trouble convincing my tribe to eat it! I´d forgotten how much I like caraway – don´t think I´ve seen it in Spain yet, but maybe that´s becuase I wasn´t looking for it! Love Cindy´s tip too…a good one to keep up your sleeve for when you have a cold. We had a shortage here last month and I was most perturbed that I would not be able to get it!